I like change. The status quo tends to drive me crazy, and I can’t just leave things well enough alone. 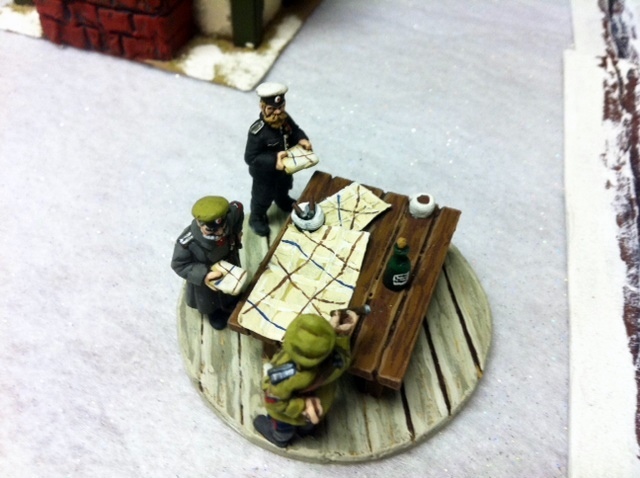 I tinker and tweak, and alter and convert things incessantly, and I’m no different when it comes to wargame rules. 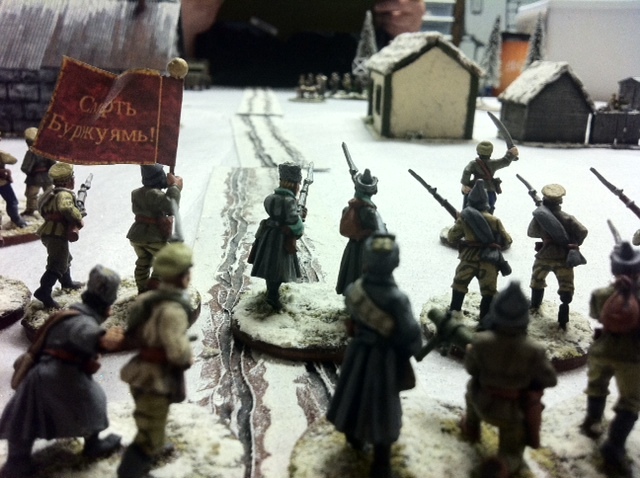 The Russian Civil War is one of the periods that interests me, and so I’ve tried to play it with various sets of rules. But the problem is, I just haven’t been able to find a set of rules covering the period that really reaches out and grabs me, so I decided to try some other rules on for size. I’ve been a big fan of the “Commander” series (Blitzkrieg Commander Cold War Commander, and Future War Commander) for a while now, and I have several battlegroups built specifically for CWC and FWC. So, I naturally figured, “Why not give them a try?”. BKC is the one haven’t really played much, but I thought it was closer to the period, so I decided to make up some army lists for the Russian Civil War and see how it works. The army lists weren’t that hard. I mostly used the existing Spanish Civil War lists and made some relevant modifications. Infantry in BKC is pretty generic, but there are rules for giving special abilities to units, and I used those. There was a wide variety of different troop types in the RCW, and I thought it would be important to reflect that. Bolshevik Naval infantry was very different from the conscript infantry units, as it was also different from the Czarist shock battalions or Czech Legion, and so on. I gave each of these troop types their own special abilities. Once I had the lists down, I headed off to Great Hall Games to test it out. 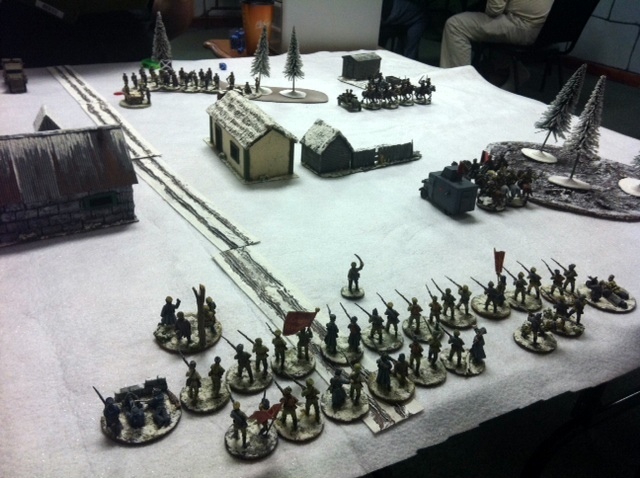 My friend Chris (aka “the Other Chris”) met me there to play as the Bolsheviks. Since this was just a test game, we went for something simple. 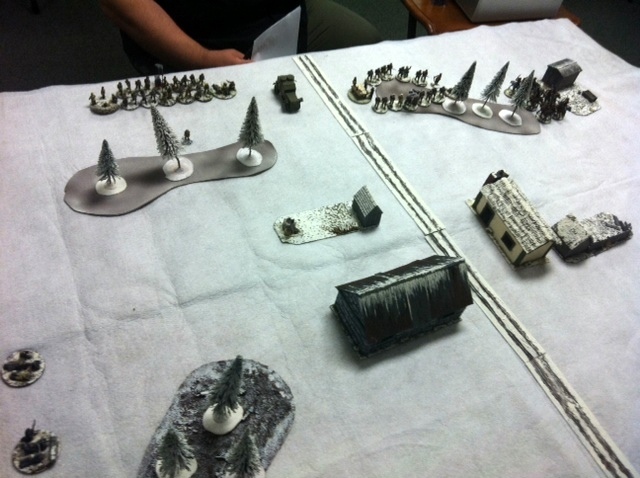 Basic “Encounter” scenario from the book, 1000 points per side, and generic terrain, with a small village in the center with patches of forest scattered around the table. The object of the game would be to inflict casualties on the enemy. 25% casualties was a minor victory and if your enemy reached the breakpoint, that was a major victory. Things started off fairly well for me. 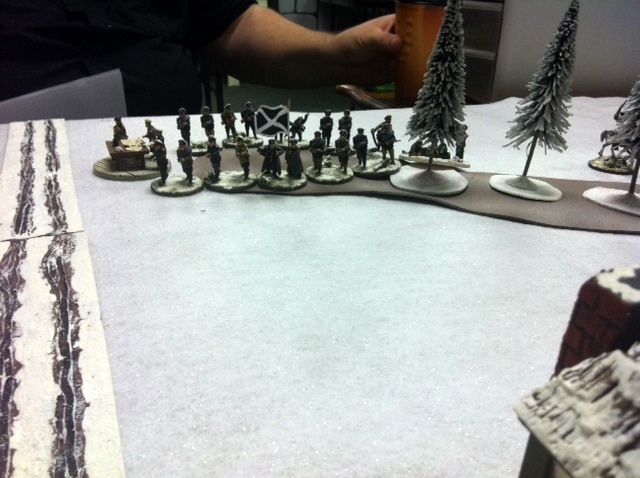 My Czarist troops got good command rolls and everything appeared on the table, but Chris’ Bolsheviks failed all of their command rolls and remained conspicuously absent from the table. 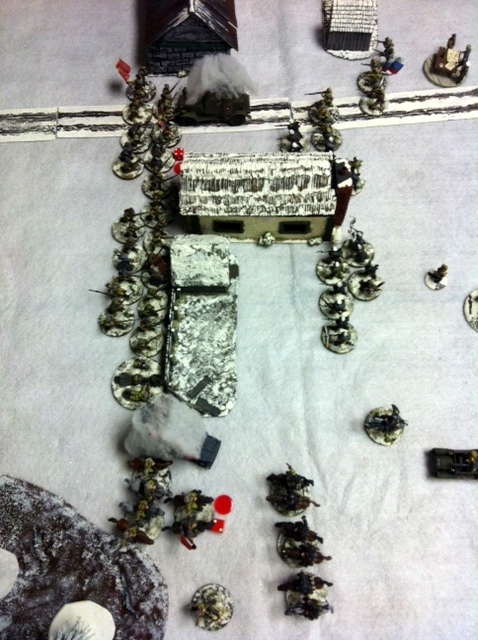 My force consisted of (from left flank to right) a unit of cossacks with a machine gun car on the flank, a group of Markov shock infantry supported by a Maxim MG, an Austin-Putilov armored car, driving up the road, and a large-ish mob of basic infantry on the far right supported by a second Maxim team as well as a mortar team. 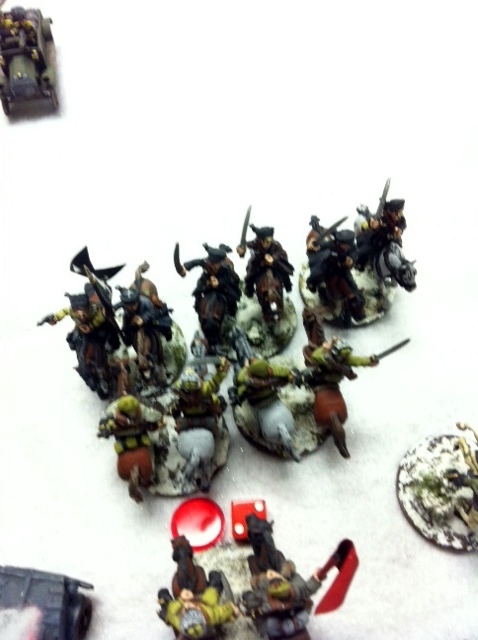 The Reds rolled better on turn 1 and all of his stuff entered. From his left to right, the Bolshevik army consisted of a group of naval infantry and partisans supported by an artillery piece, a huge mob of infantry (18 stands) in the center supported by two Maxim MGs at either end of the mob, and a small group of cavalry on the right flank supported by an armored car. For the most part, I had better quality troops with bonuses for combat (The Markovs and the Cossacks), but he had more men. 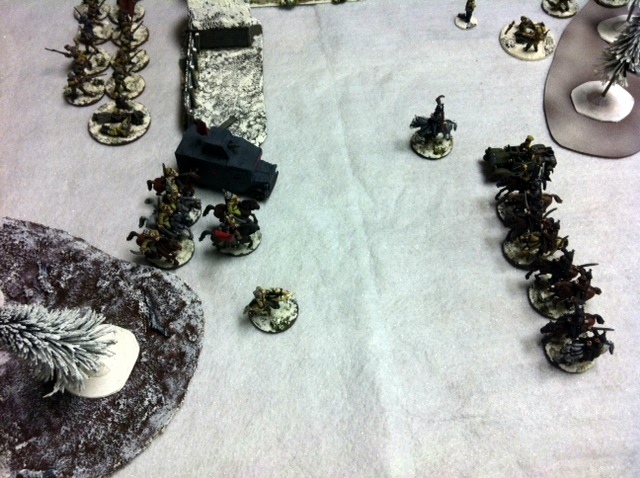 Both of the enemy’s MGs opened up and scored hits, and the armored car went up in flames without taking a shot. Oh well, no big loss, I guess. 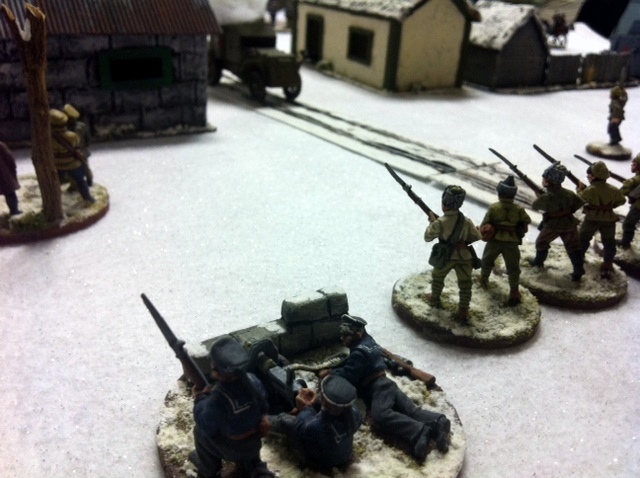 At the top of turn 3, the lines were converging on one another I began firing the mortar at long range over on my right, and it began to inflict hits and suppression on some of the Bolshevik units, and eventually destroyed one of those Maxims. 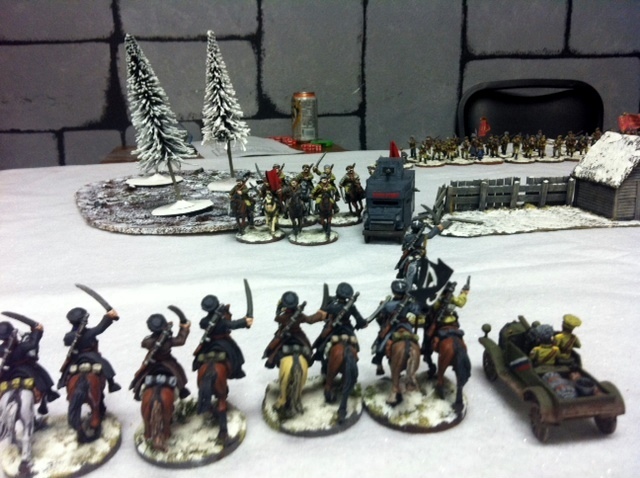 A gun duel took place on the left between the two cavalry troops, which lasted 2 or 3 turns. 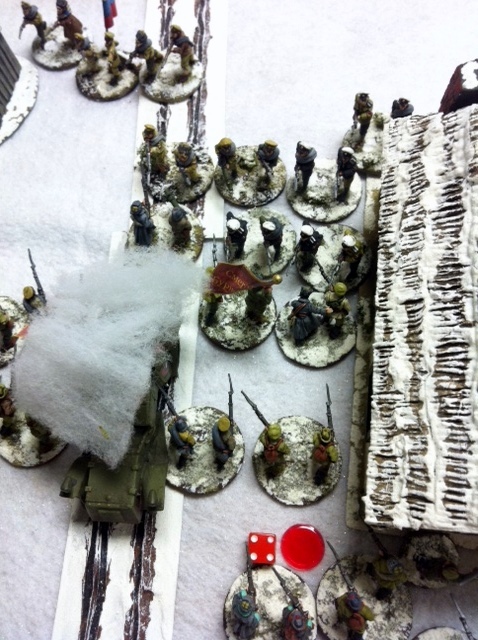 Maxim fire claimed the Red armored car and a stand of Red cavalry, and the rest red cavalry was largely suppressed. So far, I was ahead in points and things were looking pretty good. 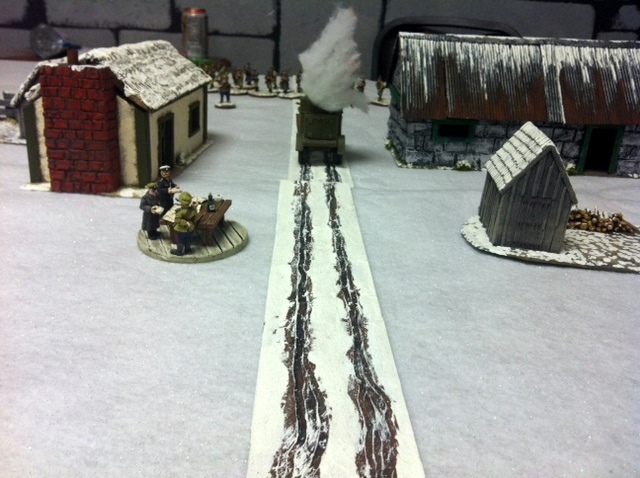 …while in the center of the village, an intense street battle broke out around the burning armored car. At this point, things are still going my way, and a few more stands of Bolsheviks were destroyed. Now here’s where things went a little weird. 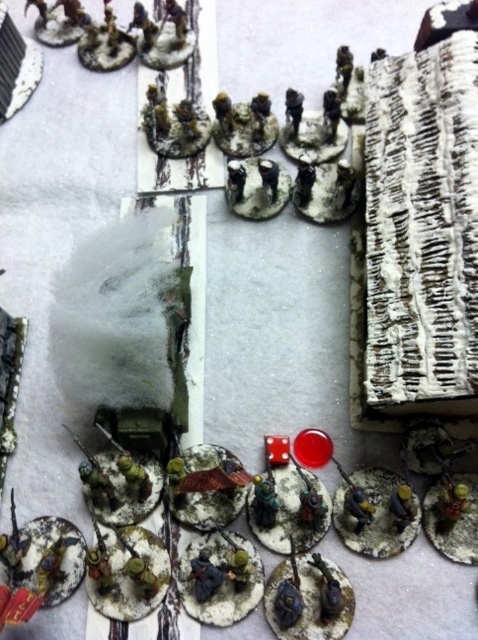 We may have misconstrued the close combat rules, butthe net result was that whole chunks of the armies seemed to melt away on contact. 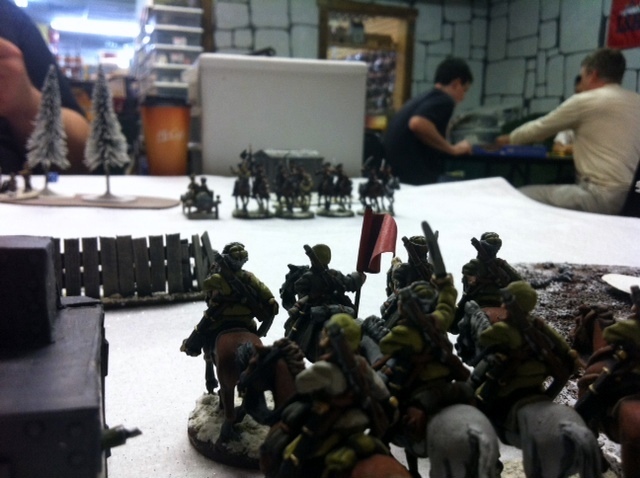 My cossacks and Markovs had bonuses in close combat and just utterly destroyed their opponents. The problem was, thee way the numbers added up, it was nearly impossible for their opponents to even do anything, and it seemed a foregone conclusion. 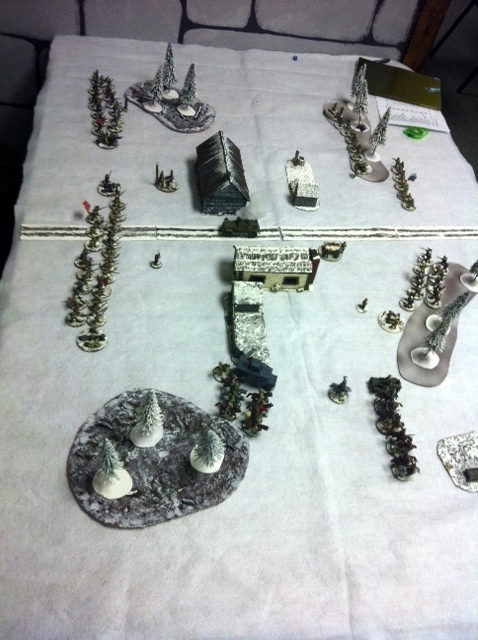 Close to half the Red army just disappeared in one turn. 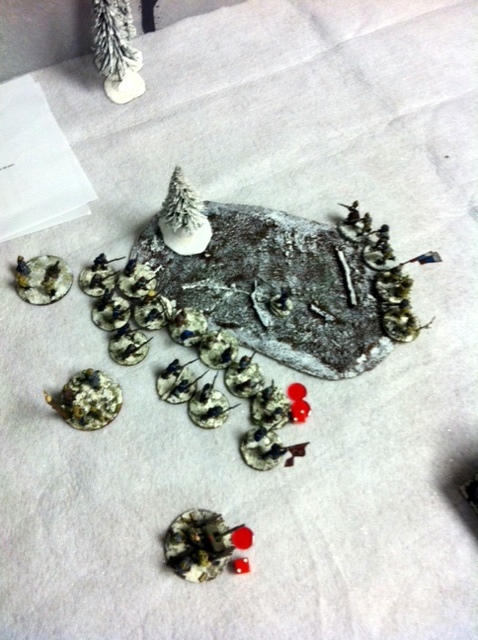 With only 3 units lost and half of my enemies fleeing or dead, it looked like a big win for the Czar. However, there were two other combats on my right involving lesser quality troops who were utterly crushed by the naval infantry. This swung the game. We both reached our breakpoints on the same turn and we called it there. Chris and I talked about the rules after the game. We both play CWC, but I don’t think BKC worked very well in this instance. First of all, it tends to generalize the infantry, and that’s really all there is in the RCW. There were no tank battles, which is what I think BKC is geared toward, with infantry in a secondary role. Neither of us liked how the close combat rules worked, although as I said, we may have been doing it wrong. Another thing I probably should have done was to increase the ranges and movement distances, but I just didn’t think about it, and we simply used what was listed in the book in centimeters. But oh well. It was a fun afternoon, nonetheless, and it did answer some questions. I am thinking of trying this out with the new Force on Force rules, next time. I’ll let you know how that little experiment turns out. I think this looked great, I would like to give it a go. Can you send me your army lists. I think the close combat rules may have changed. Yes, I think that if you just limit the close combat phase, it’ll work just fine. I like the BKC/CWC/FWC system and the rest of it went smoothly. BTW, I just looked at your site. Very nice photos! In fact I think there is a new combat system, so I might not have the problems you experieced. I would love to see how you did the army lists though. Can you post them? I found a generic world war one army list, but it was a little too… generic.